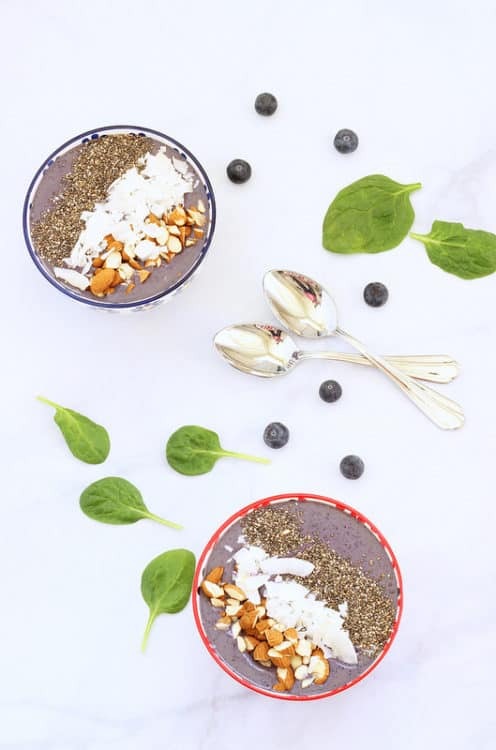 Since a whopping 80% of our immune system is in our gut, it’s important to feed it properly, and this wild blueberry kefir smoothie bowl is just what the doctor ordered. I’m so happy that the theme for this month’s Recipe ReDux post is Gut Health, because I’ve had this topic on my list for a while. Our gut is home to millions of good bacteria which are collectively known as our microbiome. For years now, researchers have been working to learn more about exactly what these bacteria do for us, and whether or not they play any role in our health. Well, it turns out, that they are ridiculously important in controlling everything from our weight, to our blood sugar, to various stomach and gastrointestinal disorders, autoimmune diseases, and even anxiety and depression. They’ve also discovered that a huge portion of our immune system is in our gut, and it’s health depends on what kind of bacteria live there. Who would ever think that bacteria – which most of us associate with being sick, could have such power over us? The more scientists learn about the human microbiome, the more interesting things get. They’ve discovered that people who are obese have a different bacteria profile than those who are thin. They’ve also found that if you inoculate someone with diabetes with the bacteria from someone who is healthy, their diabetes drastically improves. Crazy, isn’t it?? They’ve also discovered that the type of bacteria in our systems, and whether it’s helpful or harmful to our health, depends on what we eat. You knew that was coming, didn’t you? Those who have more of a plant-based diet have a much healthier microbiome and a stronger immune system. People who eat lots of processed foods, fast foods, sugar and artificial sweeteners have a completely different microbiome, and it’s not a very good one. Luckily, there are some things you can do to improve your diet and make your gut a happier place for healthy microbiome to move into. As the good guys move in, the bad bugs get pushed out, because they don’t get along very well. 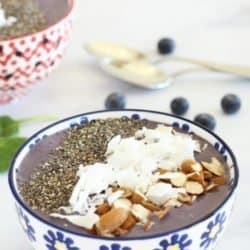 This smoothie bowl is full of gut-happy, immune boosting foods and a perfect blend of probiotics and prebiotics: wild blueberries, banana, spinach, oats, kefir, chia seeds, almonds, and coconut. Your healthy bacteria are craving it right now. Place the frozen blueberries, banana, spinach, oats, and kefir into a blender and blend on high speed until smooth. 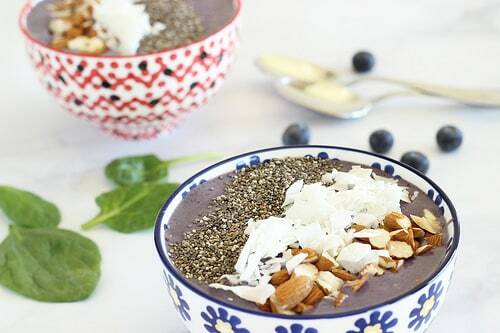 Pour into 2 bowl and garnish with the chia seeds, coconut and chopped almonds. 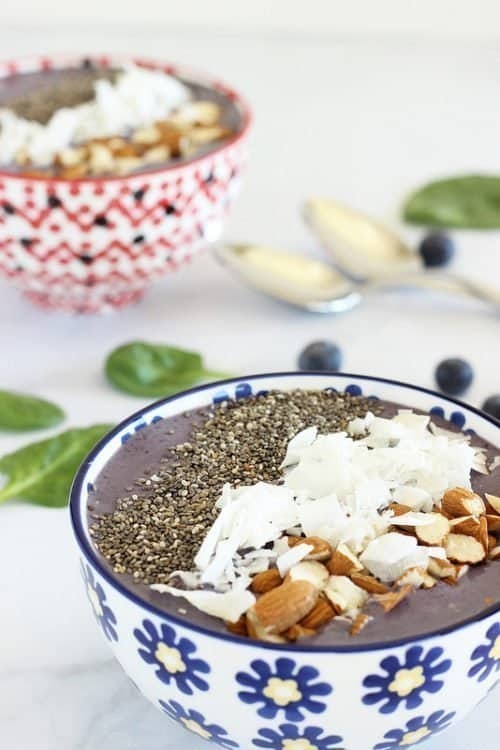 The smoothie bowl will thicken as the oats and chia seeds absorb more of the liquid. Did you know about the link between your gut’s bacteria and your immune system? Do you have any favorite probiotic and prebiotic foods? Make sure you visit the Recipe ReDux link below for other gut-healthy recipes and inspiration.